The major elements of Mikhail Bulgakov’s 1925 novel The Heart of a Dog, adapted for the stage and called A Dog’s Heart, are all present and correct in this faithful production. 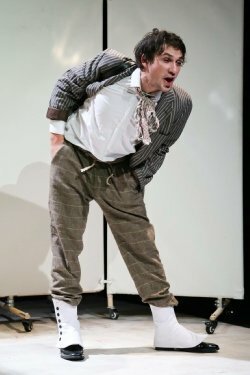 Professor Philip Philippovich Preobrazhensky (Oleg Sidorchik) has some unconventional medical techniques – in this production, in one scene, the Professor’s patients are subjected to a pants-down examination (and not the American definition of ‘pants’ either). This does not mean the audience is subjected to the full human anatomy on stage – the dialogue says what it says, and even with the extensive use of video technology, the rest is simply assumed (or, for those inclined, imagined). It’s the special effects and videography that is of interest in this show. Given the 1920s setting, the images are in black and white. Just as the opening scene was starting to get a little too cinematic for my liking, the screens were pulled back to portray the professor’s accommodation. The portrayal of a snowy blizzard outside accompanied by Sharik (Sergey Kotukh) howling alongside the noise of the wind bookends the play. The professor is assisted by Dr Ivan Arnoldovish Bormental (Vadim Bogdanov), and along the way, the two clash over the professor’s methods and the way they should proceed when things go awry with Sharik. As the novel is such a famed piece of Russian satire, I trust it is not too much of a spoiler to reveal the basics: Sharik is a dog without an owner (a stray, if you will), so is taken in by the professor, who tempts the dog with food. After some time for adjustment and getting used to domestic life, Sharik is prepped for surgery. We do not see the procedure – on balance, it is probably a good thing that video technology was not used for such purposes – but the dog effectively transforms into a humanlike creature (it’s as Frankenstein-esque as it sounds), though he never adopts civilised mannerisms, but still manages to land a government job. Tellingly, his role is to rid the streets of Moscow from stray cats. Eventually, the professor ends his experiment with Sharik. Or does he? It works well performed in Russian, and thankfully there are English surtitles – a friendly message kindly asks non-Russian speakers to ensure they are seated somewhere in the auditorium where they can see the surtitles comfortably (seating is unallocated). It is, to be frank, best enjoyed by speakers of Russian, if only certain terms don’t translate that well, as is the case with most languages. The medical terminology is there, too, giving some authenticity to the professor’s credentials. Some punchlines, which were met with muted responses from the likes of yours truly, had (some) speakers of Russian laughing heartily. Rather like watching an opera in its native Italian, in this play, the feelings and emotions of characters are vividly conveyed regardless of one’s familiarity of the language. The increasing levels of absurdity give rise to increasing levels of hilarity, both at a political and personal level. The dog-like behaviour manifested by Kotukh’s Sharik is remarkably convincing. Zina (Vlada Lemeshevska), the professor’s servant, isn’t treated very well by anyone, though she does at least receive apologies for having been previously shouted at. There may be very different political conversations being had these days than the ones portrayed here, but there’s no denying A Dog’s Heart still has a considerable bite. A lively and accessible production. A Dog’s Heart is a contemporary adaptation of Master and Margarita’s author Mikhail Bulgakov’s satiric masterpiece. This adaptation, marking centenary of The Russian Revolution, enjoyed a sold-out run at Pleasance Theatre in London in 2017 and comes back on stage for a limited run. A Dog’s Heart written in 1925, set in the surrealistic world, and featuring a stray dog named Sharik who takes human form as narcissistic incarnation of the New Soviet Man, was banned in Russia for over 60 years for its controversial portrayal of the social clash between the old and the new generations. The plot of this story, traditionally interpreted as an allegory of the Communist revolution, sounds surprisingly relevant in today’s world. Xameleon Theatre’s adaptation makes this classical story modern and powerful by bringing to the surface the struggle between opposing social classes and their conflicts.